Needless to say, it’s been a cold winter thus far! As your local HVAC contractor, we want to ensure that our customers stay as comfortable as possible during this chilly season. But we also want to make sure you’re doing so efficiently. High efficiency heating is accomplished in many ways, but one of the best ways is through correct use of your thermostat. Better use of your thermostat and control of your settings can do a lot for your heater, including reducing repair needs and helping it last longer. Unless you have upgraded to a variable speed heating system, chances are your heater still operates at a single speed. Unfortunately, not enough homeowners understand what this means for efficiency, and how to best stay comfortable with this type of heating. We get it, when you get home from work or home from a day out in the freezing cold, your main goal is to be comfortable. So, you may raise the temperature on the thermostat as high as you can. This way, your home will heat up faster, right? Well, no. This is a common misconception. Turning up your thermostat higher doesn’t make your home heat up any faster, since most furnace and heating systems move at just one speed to move warm air—you’ll just end up wasting energy. The first step in avoiding thermostat setting trouble is to agree on a setting to begin with, with your family. We’d advise you as a family to agree on a temperature and make sure you stick to that. 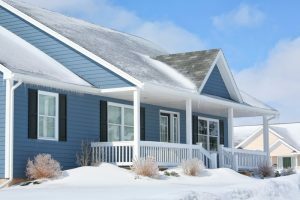 According to the U.S. Department of Energy, the most efficient temperature for your home is about 68°F, and this is a temperature most people can feel comfortable with in the winter. When you agree on a thermostat setting, you won’t need to make changes as frequently—changes that can allow for unnecessary wear and tear on your heating system. Whether you’re having trouble operating your thermostat or it’s an outdated model, you may want to consider upgrading it. Even a simple change from the old manual “slider” thermostat to the most basic of digital thermostats is a good trade. Digital thermostats are precise, whereas the manual type can be off by a couple of degrees. A programmable thermostat is even better, and then the top choice is the smart thermostat. A smart thermostat looks at your temperatures settings over time, “learns” from them, and then adjusts accordingly depending on the time of the day and the conditions in the home. Upgrading or using your thermostat correctly isn’t the only way to boost your heating efficiency. Scheduling maintenance on an annual basis is actually the leading way to guarantee efficiency. It also will benefit you to ensure you have the proper home insulation in place, and that you have the appropriate weatherstripping installed around drafty doors and windows so that conditioned air does not escape the home. For expert heating services in Pittsburgh, PA as well as expert thermostat services, contact Boehmer Heating & Cooling today!